With a player experience that pays homage to B-grade horror films of the 1950s, Ideal’s Tiger Island game makes me wish I had been privy to the conversations of the product design team that released it back in 1966. As Stefon from Saturday Night Live Weekend Update fame would say, this game has EVERYTHING: a hip island locale, castaways, marbles, DIY raft building, and a giant spinning tiger. Players assume the roles of shipwrecked castaways on a deserted island. To begin, each castaway has must be finish building an incomplete raft by adding logs to it. The first player to add 16 logs to his raft, as well as a rescue flag, escapes the island and wins the game. 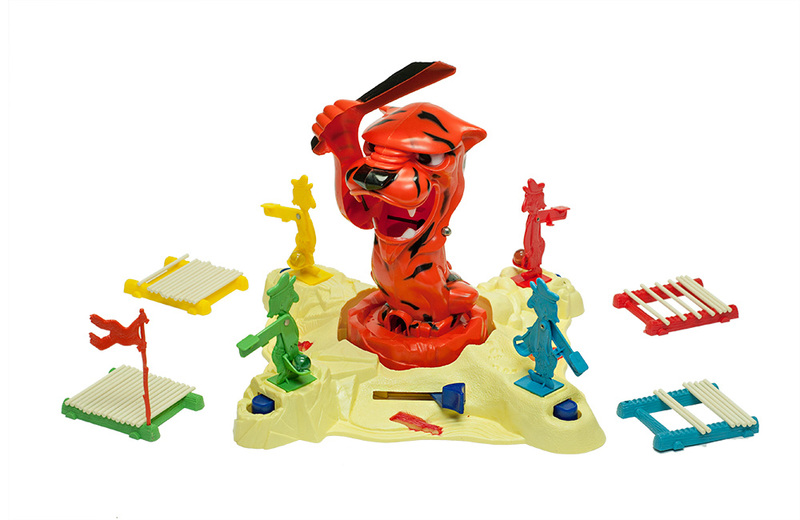 Standing between the players and victory is a plastic, foot-high tiger standing on its hind legs and brandishing a large club. Players take turns spinning and stopping the tiger at random in front of other players (or even themselves.) Once stopped, the tiger must be “fed” by quickly flipping a marble into its open mouth by flicking the castaway’s arm. If a player is successful, one or more logs are added to her raft. If not, the tiger bashes her in the head with his club! To added insult to injury, the player must also relinquish one or more logs to other players at the same time. 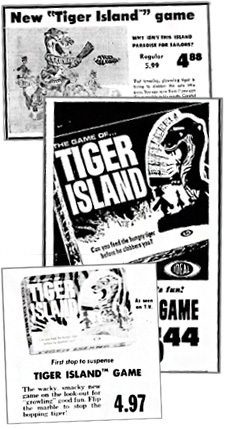 In its advertising, Ideal referred to Tiger Island as “the wacky, smacky new game on the look-out for ‘growling’ good fun.” The box itself posed the question, “Can you feed the hungry tiger before he clobbers you?” This type of colorful advertising helped the game stay on the market for four years before it was discontinued. Trouble is a simple “roll-and-move” board game for 2 to 4 players that features the Pop-O-Matic, a small, clear plastic dome housing a single die.